Another guy, commuting by bike in Kansas City...sometimes. 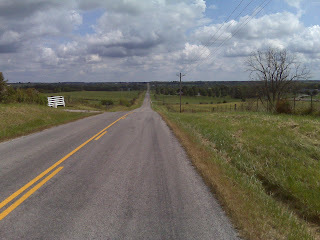 On Sunday, I sagged forward with most of Team MO-KAN-DO (the team I rode with) past the big hills to Warrensburg. Glad I did. 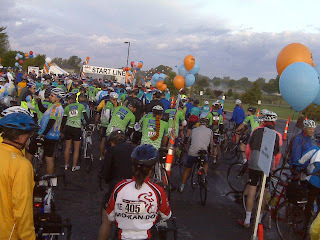 The headwinds were brutal all day and I would have a hard time doing the full 80 miles. At lunch, I bumped into Randall from the Un-Lenexa Cave Ride. He was riding a fixie the whole way - quite a setup. 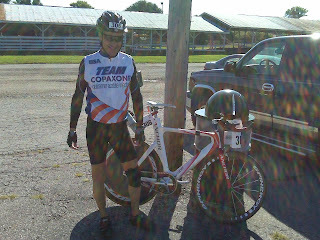 This picture is not great, but it was a kind of time-trial looking bike with a Spinergy wheel on the front and a Zipp wheel on the back (the Zipp was not wind-friendly, he said - it acted like a sail). Gotta hand it to him, though. Anyway, had a great time and know what to expect for next year. 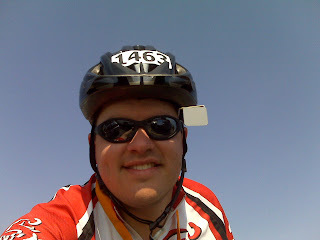 Definitely going to bring the iPOD and the pannier was nice to have, though it probably slowed me down a bit. Definitely going to ride with the team again. The best part was crossing the finish line as I took my medal from a lady in a wheelchair who has MS, I heard her clearly say "Thank you!". All worth it. Thanks to those who donated. Still not too late if you want - here's my donation page. Daddy. Arcade nut. Noob cyclist. Drum hack.